Detroit’s “Gang of Four” plus one: (l to r) LR director Lamont Satchel, Police Chief Ralph Godbee, COO and city’s defacto mayor Chris Brown, CFO Jack Martin, and Program Mgt. 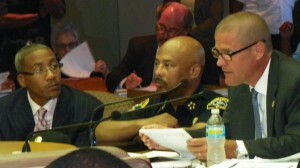 Director Kriss Andrews, at Council table 7/16/12. Council President Charles Pugh said he was the deciding “No” vote on the CET. By the same reasoning his was the deciding “Yes” vote on the consent agreement, the poisonous tree from which all subsequent actions have fallen. The consent agreement clearly spelled out its union-busting intent. 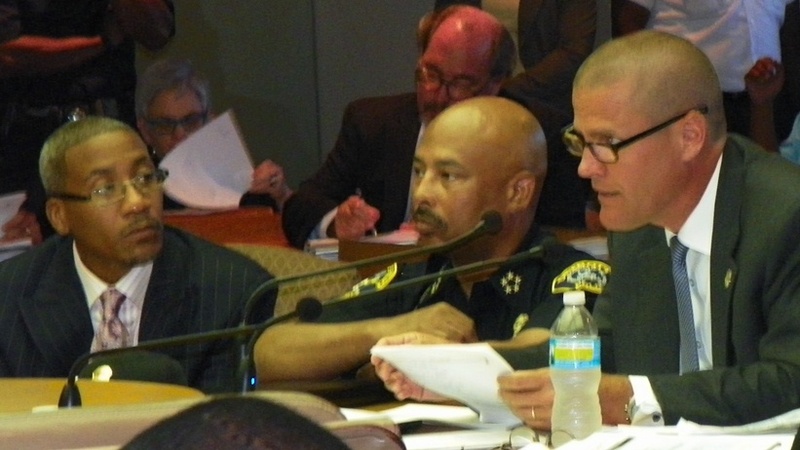 Detroit’s new “Gang of Four,” Chief Operating Officer (COO) Chris Brown, Program Management Director Kriss Andrews, Chief Financial Officer (CFO) Jack Martin, and Labor Relations Director Lamont Satchel, along with Police Chief Ralph Godbee, presented the CET package to Council July 16. It includes even more severe cuts than those in a package sent to unions earlier. 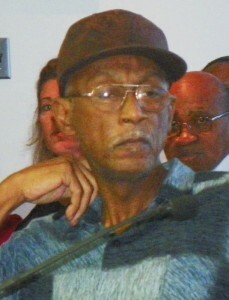 Pennington represents civilian workers at the Police Department. Tyrone Travis of Free Detroit-No Consent, previously with Coalition to Stop Privatization and Save Our City, working-class activist since the 1960’s. 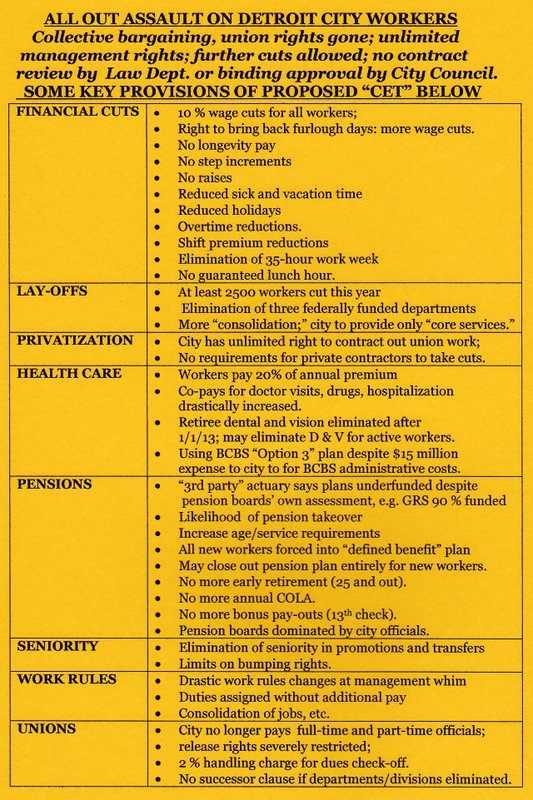 The CET includes a 10 percent wage cut and other financial cuts, with more possible in the future, an assault on the city’s pension plans and retirees, including elimination of dental and vision care after Jan. 1, 2013, a 20 percent annual premium co-pay on health care, elimination of seniority rights in promotions and transfers, work rule changes at the city’s whim, and cuts in union representation rights, to cite a few. 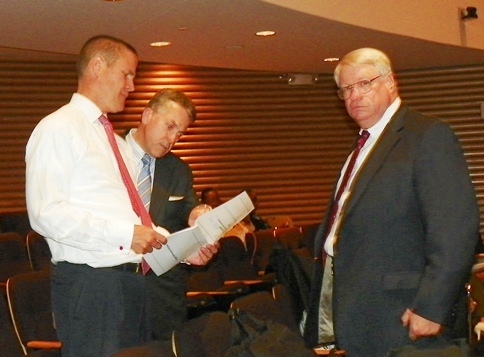 Detroit PMD Kriss Andrews (r) glares at camera as COO Chris Brown (l) discusses proposed CET with Atty.Michael McGee, a co-author of PA4, before FAB meeting June 28, 2012. The plan allegedly will save the city $102 million in labor costs. The city’s PA4 Financial Advisory Board (FAB) vetted and approved it earlier in three closed sessions with State Treasurer Andy Dillon, Brown, Andrews, and Satchel also present. Under the consent agreement, the FAB can impose the contract regardless of the Council’s vote. A coalition of city unions earlier bargained a contract that would have saved the city $180.2 million, according to its chief negotiator Ed McNeil, but Gov. Rick Snyder and State Treasurer Andy Dillon would not agree to let the Council finalize it. This was the first time city workers and union officials even saw the current plan. Al Garrett, Pres. 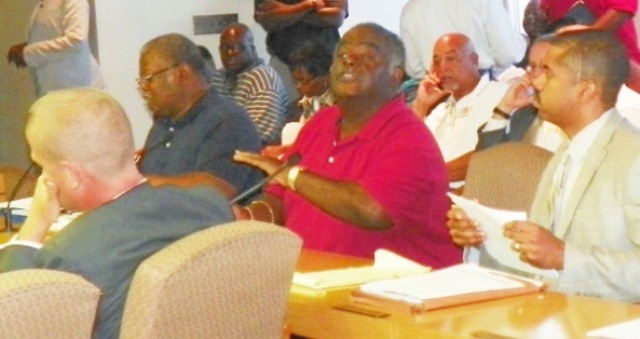 AFSCME Council 25 (in red shirt), with COO Chris Brown (l, looking bored), chief negotiator Ed Mcneil at Garrett’s right, Richard Mack at far right, during Council meeting July 16, 2012. 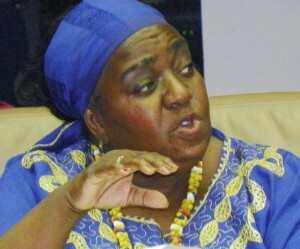 Councilwoman JoAnn Watson at table July 16, 2012, says city needs to re-negotiate debt to banks. Councilwoman JoAnn Watson said the City Charter requires collective bargaining, and that the consent agreement does not pre-empt that obligation under three sections of the Public Employee Relations Act (PERA) not barred by Public Act 4. 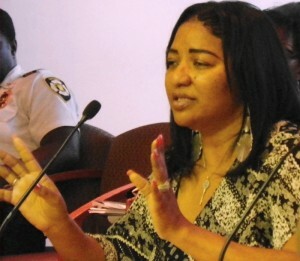 She also brought up the possibility of a moratorium on the city’s debt. 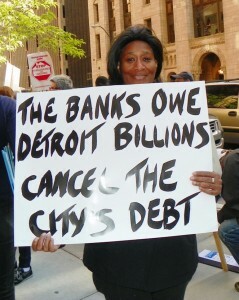 Linda Willis at demonstration calling for a moratorium on Detroit debt to the banks, held May 9, 2012 in downtown Detroit. The city paid $597 million to the banks in the 2011-12 fiscal year, and carries a total debt load of $12.6 billion. Watson added that Gov. Rick Snyder should restore residency requirements for city workers to increase the city’s revenue base. She asked why the Law Department, headed by Corporation Counsel Krystal Crittendon, had not been consulted on the package since it must approve all contracts. City officials admitted that the law firms of Butzel Long, Miller Canfield, and Ernst & Young have been retained instead to advise on the contracts, at millions of dollars in expense to taypayers, let alone the costs for the salaries and staff of the CFO, the PMD, and the FAB. 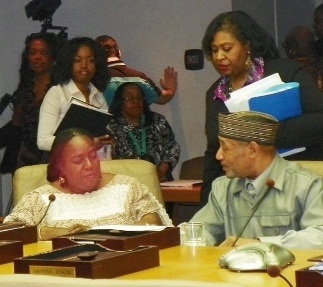 Council members JoAnn Watson (l), Brenda Jones, (center) Kwame Kenyatta (r) consult after consent agreement vote April 4, 2012. Council members Pugh, Gary Brown and Saunteel Jenkins contended that an emergency manager would have been worse. Detroit’s defacto first white mayor, COO Chris Brown, smirks at Council table July 16, 2012. Neither Mayor Dave Bing nor Deputy Mayor Kirk Lewis were at the table. Brown, who led the administration’s presentation at the opposite end of the table from Council President Charles Pugh, appears to be the city’s first white mayor, de facto. 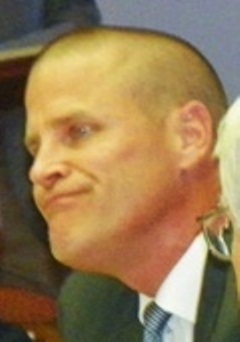 Andrews was most recently Chief Financial Officer at Energy Conversion Devices, which filed for bankruptcy in February. Neither he nor Brown have had any prior experience dealing with the public sector. Under the consent agreement, Andrews has veto power. Jack Martin, also former Highland Park schools EM, chewed out by Highland Park parents. 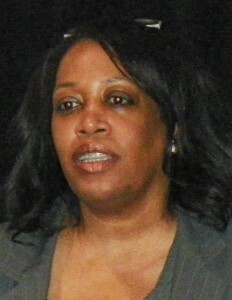 Martin was a member of the Detroit financial review team Snyder appointed and also Highland Park Schools EM. He previously served under U.S. President George W. Bush as CFO for the U.S. Department of Education, where he helped implement the pro-charter school No Child Left Behind Program. 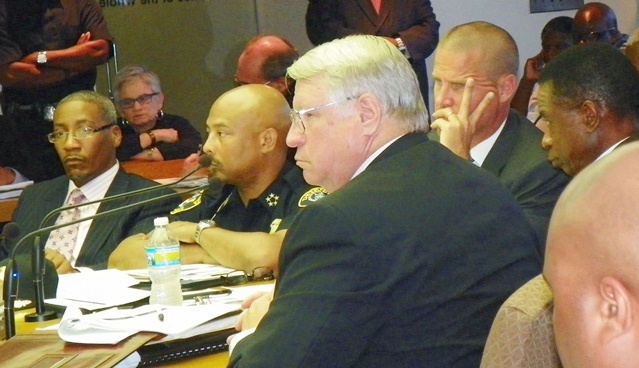 He is making $224,000 as the City’s CFO, also with veto power under the consent agreement. 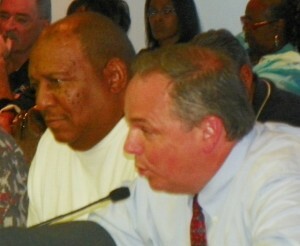 Labor Relations Director Lamont Satchel (l) listens intently to COO Chris Brown at Council table July 16, 2012. Martin did not produce any financial documents detailing evidence of projected cash flow shortages. Satchel insisted that the Labor Relations Division and department heads were responsible, in “collaboration” with the FAB, for producing the meat of the CET. 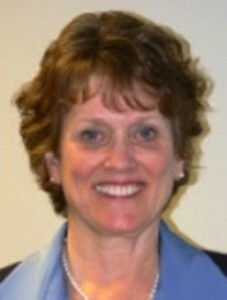 Jan Winters, Snyder’s director of Office of State Employer. However, Ed McNeil, chief assistant to AFSCME Council 25 President Al Garrett, said that State Treasurer Dillon told him that Jan Winters, head of the Office of the State Employer (as she was under former Gov. John Engler), oversaw the drafting of the package. Satchel also repeatedly insisted that the “duty to bargain has been suspended” under PA4. However, Attorney Richard Mack, representing AFSCME, cited three clauses in PERA that were not suspended. Mack and AFSCME Council 25 have asked Crittendon to review the proposed CET and issue a legal opinion, in a letter sent July 16. He also gave Council a copy of the letter. 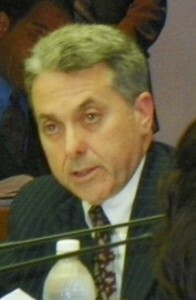 Michael McGee advising Council on PA4 consent agreement April 4, 2012. When it voted 5-4 for the consent agreement, which allowed the current scenario to take place, the Council instead listened to legal advice rendered by Attorney Michael McGee of Miller, Canfield, Paddock and Stone. 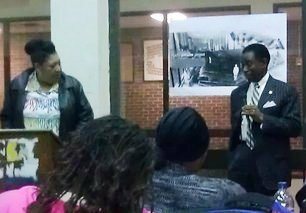 Council member Kwame Kenyatta exposed McGee as a co-author of the language in Public Act 4, a contention confirmed by McGee himself in an article for the Michigan Municipal Advisory Council newsletter. Click on City CET Council Discussion Document 2012-07-16_1_5 to read entire package. Click on AFSCME 25 letter to Krystal Crittendon to read entire letter. I have not followed the sitution in Detroit until early this summer, so I was unaware that you had previously published these terms. Thank you for the link, I read the union proposals. Many of them were excellent, and would help the situation. Two of them are in the new proposal, those being the wage cuts ,and the change in hours from 35 – 40 hours at no increase in pay. It seems to me that since the unions would require the contractors to take a 15% cut in their proposal, they should agree to the provision for the 10% pay cut for members that is proposed by the financial manager. I did not notice any offer in the union proposal for a change in work rules, or a reduction in pay which is part of the new proposal. The article stated that the previous union contract saved the city $180 million but was never approved by the city council. Why don’t you obtain a copy of that proposed union contract, and compare it to the imposed contract? Then everyone would be able to examine the two contracts to determine how they differ and how the union contract would still be acceptable to the members but save the large amount of money? You have not been following all of VOD’s stories on this matter. Go to http://voiceofdetroit.net/2011/12/03/michigan-moves-to-take-over-detroit-other-majority-black-cities/ to read story on unions’ meeting with City Council Dec. 1, 2011 where package of proposals from unions was presented. There is a link to unions’ document. You are also ignoring the major issues discussed in the story, which include the fact that the lion’s share of the city’s budget goes to the banks–$597 million in 2011-12 alone. Read upcoming story on LIBOR bank fraud scandal and how cities are now suing the banks for fraudulent lending practicies to municipalities.